Telangana State Public Service Commission website is launched and logo is unveiled and will play important role in the future of Telangana. Online registration is initiated and paper registration is not available. Candidates can directly get information on notifications if they register themselves on the TSPSC official website. 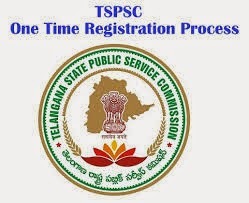 TSPSC launched E-REGISTRATION - One Time Registration facility for all the candidates to register on the TSPSC website providing the requisite information such as Aadhaar details, personal details, exemption details, address detail, educational qualification. All the candidates who are applying online should keep their photograph and signature scanned. Photograph and signature of the candidate should be should be in JPEG format. Photograph should have candidate name and photograph taken date printed below photo and file size should be 50KB and dimension 3.5cm x 4.5cm. Once candidate register at the official website of TSPSC they will get intimation of notifications and test results at email and text messages on mobile. TSPSC application process is made online.